Owen Sound Volkswagen's detailing products & services will enhance your vehicle's appearance, both inside and out, as well as protect your vehicle from harsh environmental conditions. Exterior - Complete, meticulous handwashing of vehicle exterior, including door handles and trunk openings. Interior - Precise cleaning of interior, vacuuming of seats, carpets & floor mats, cleaning of glass & instrument panel. Wheels - Power wash of wheels, wheel dressing applied. Exterior - Machine polish with paint finish protectant, power wash of inner fender & undercarriage. Interior - Vacuum of trunk, shampoo of floor mats, spot shampoo of stains on upholstery & carpets - subject to inspection. • Gold Detailing Package - BEST! Under the Hood - Engine compartment & lower body cleaning & degreasing. Exterior - Two-step paint restoration process to eliminate minor paint imperfections & bring back shine. Interior - Complete interior shampoo of fabric seats, mats & door panels. There is no better time than now to bring back that "NEW-CAR FEELING". Book your appointment now! *Certain conditions apply. 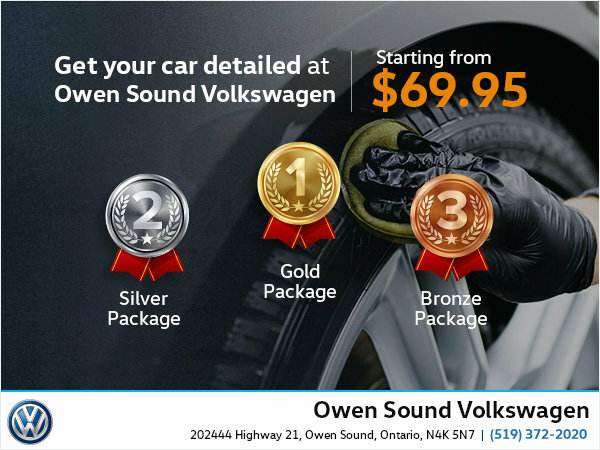 Owen Sound Volkswagen reserves the right to refuse detailing services if the vehicle in question is damaged or in a condition that is beyond the capability of cleaning and repair by detailing. Prior to your detailing appointment, please remove al child seats & all personal propery that impedes cleaning. We cannot be held responsible for the removal or installation of child seats.